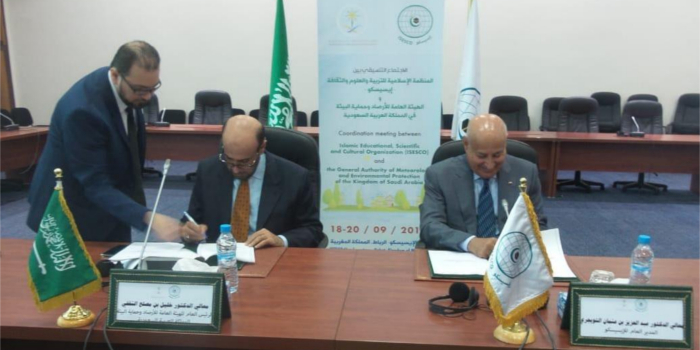 The Coordination Meeting between ISESCO and the General Authority of Meteorology and Environmental Protection in the Kingdom of Saudi Arabia, held on 18-20 September 2018, at the headquarters of the Islamic Educational, Scientific and Cultural Organization (ISESCO) in Rabat, concluded its proceedings today morning. The Meeting discussed many issues relevant to the organization of the 2nd Award of the Kingdom of Saudi Arabia for Environmental Management in the Islamic World (KSAAEM), 8th Islamic Conference of Environment Ministers and the Programme on the Celebration of Islamic Capitals of Environment and Sustainable Development. At the closing session of the Meeting, the Director General of the Islamic Educational, Scientific and Cultural Organization (ISESCO), Dr Abdulaziz Othman Altwaijri, and Dr Khalil bin Mosleh Al Thaqafi, President of the General Authority of Meteorology and Environmental Protection in the Kingdom of Saudi Arabia, Chairman of Islamic Conference of Environment Ministers and Head of the Islamic Executive Bureau of Environment, signed the Meeting’s report containing the agreement on many measures on the preparation for the 8th Islamic Conference of Environment Ministers, 5th Meeting of the Islamic Executive Bureau of Environment, and KSAAEM (session of 2018-2019). In this regard, the two parties agreed to hold the 5th Meeting of the Islamic Executive Bureau of Environment on 19-20 April 2019 at ISESCO headquarters, a meeting of experts on 19 April 2019 and a meeting of ministers on 20 April 2019. They also adopted the draft agenda of the Executive Bureau and the Conference, and the theme of the 8th Islamic Conference of Environment Ministers: “Role of Cultural and Religious Factors in Environmental Protection and Sustainable Development”, to be held on 2-3 October 2019, at ISESCO headquarters. In the same vein, they decided to coordinate their work so as to activate and better develop KSAAEM Media Plan, make proposals to enhance the Award website, further publicize and disseminate it, and benefit from the available technologies to that end in accordance with to the report that will be prepared by the two technical teams. Further, the two parties agreed to present the amendment to the Award’s budget spending areas to the competent authorities in the Kingdom of Saudi Arabia, actively provide the Authority with the names and countries of the nominees, intensify media campaigns, use various information and communication technologies to publicize the Award, and suggest new members for the Award Higher Committee. Moreover, the meeting agreed to continue consultations on the arrangements of the 8th Islamic Conference of Environment Ministers and its Executive Bureau, KSAAEM Award Ceremony; form a joint team for this purpose; and hold the 2nd Coordination Meeting in the first week of March 2019.